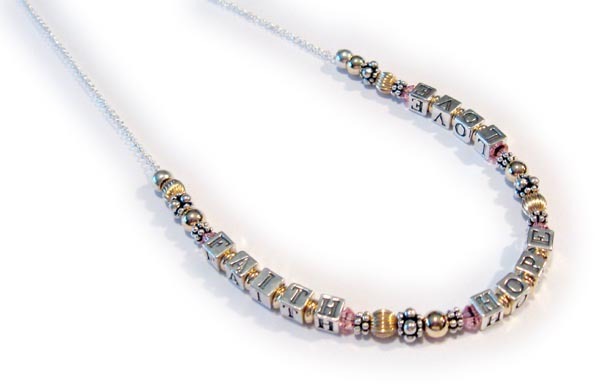 This Gold Faith Hope & Love Bracelet is made with 4.5mm sterling silver alphabet block letters and 14k gold-filled beads in between the letters, 4mm bicone Swarovski crystals (April or clear crystals shown) .925 sterling silver Bali beads and 14k gold-filled beads. Shown with an upgraded 14k gold plated lobster clasp. 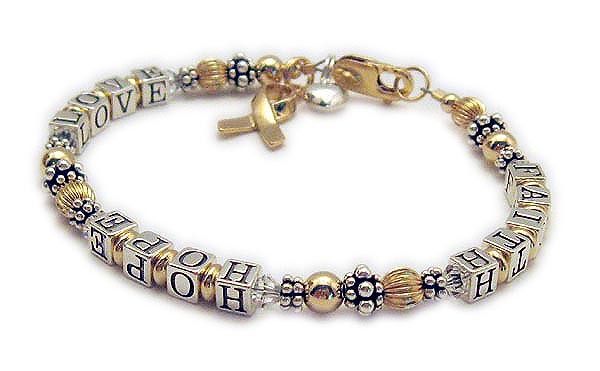 This Gold Faith, Hope and Love bracelet also comes with a 14k gold plated ribbon charm. Optional heart charm is shown in the picture. 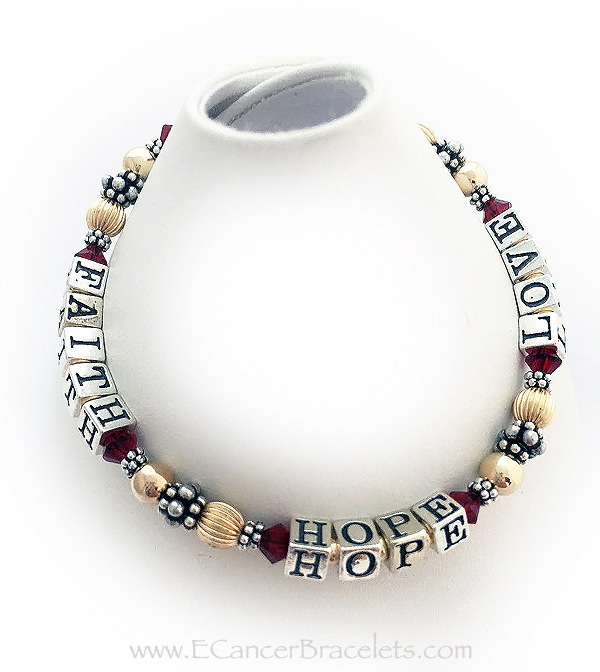 This FAITH HOPE LOVE bracelet is shown with 14k gold-filled beads and RED Swarovski crystals before and after the words. The sterling silver alphabet blocks are approximately 4.5mm. 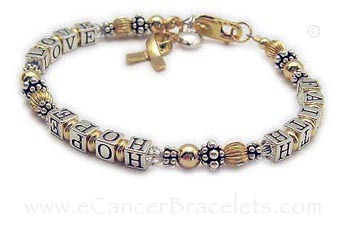 The gold-plated ribbon charm is included in the price. 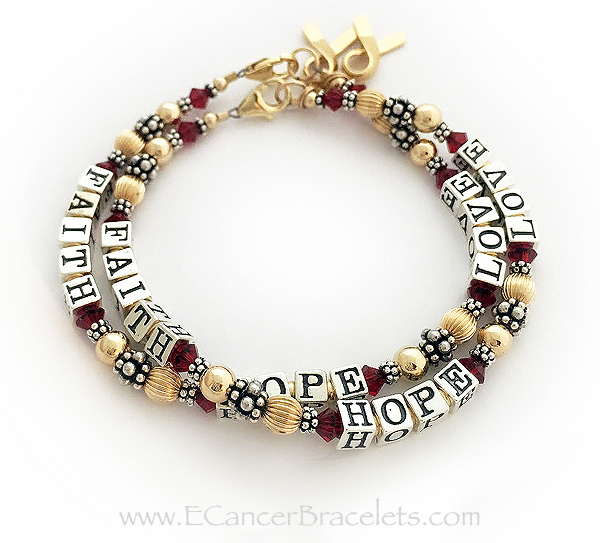 Size shown: 7 1/2"
This FAITH HOPE LOVE bracelet is shown with 14k gold-filled beads and RED Swarovski crystals before and after the words. The sterling silver alphabet blocks are approximately 4.5mm. The gold-plated ribbon charm is included in the price. Sizes shown: 7 1/2"